Cognitive awareness of the subtle shifts of weight on the pelvis can make a difference between being able to sit upright or collapsing into twisted slumping. Implementing this proper pelvic alignment in a seated position requires each individual to consciously recognize where the weight shifts on each of the ischial tuberosities or sit bones If your client can experience the various options of front/back, side/side, and right/left of the pelvis movement repertoire, then choosing “center” becomes a relative position and easier to replicate. These learned proprioceptive skills can correct dysfunctional patterns, reduce back pain and create body symmetry with improved muscular balance. Yoga blocks needed for shorter legs on Reformer. 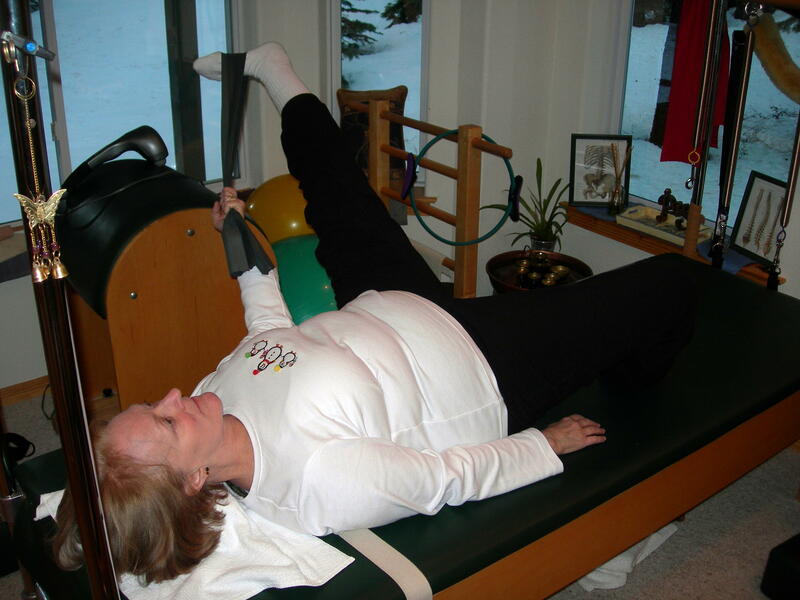 Unhook all of the springs on the Reformer and instruct your client to sit on the edge of the carriage on a medium-sized 12″ rotator disc facing the footbar holding a medium-size dowel across the sacrum. Advise your client to be careful when sitting down since the carriage has the potential to slide away without the springs. If your client is too short, you may require the use of yoga blocks or some other prop to bring the legs to a 90-degree angle. Eric Franklin instructs how the sacrum moves when shifting the pelvis forward and back in his book Conditioning for Dance (page 92) with helpful tactile cues. “1. Place a hand on the sacrum, and detect the bumps on the back of the bone. These bumps are the spinous processes of its five fused vertebrae. To feel the movement of the sacrum, it is easier to touch the adjoining bones that are easy to feel under the skin, the tailbone and the lumbar spine. 2. Place the middle finger of one hand on the tip of the tailbone, and place the middle finger of the other hand on the spinous process of the fourth or fifth lumbar vertebra. 5. Tilt the pelvis forward again and notice that nutation is linked with the spreading of the sit bones. 6. Tilt the pelvis backward, and notice that counternutation is linked to the converging of the sit bones. To give my clients the feeling of the pelvis as a whole, I describe an anterior pelvic tilt (sacral nutation) as a “Christmas tree” with a wider base at the sit bones and narrower feeling at the top of the pelvis (ilium) and a posterior pelvic tilt (sacral counternutation) as a “funnel” with a narrower base and a wider feeling at the top of the pelvis. The benefit of being on the Reformer without springs is that the carriage should move slightly backward in the anterior pelvic tilt and forward toward the calves in the posterior pelvic tilt. If the carriage does not move front and back, then the initiation of the movement is incorrectly occurring at the rib cage instead of being driven by the pelvis. The dowel also assists in helping your client observe and feel the shifting pelvis. Notice if your client tends to put more weight on one sit bone or the other when moving, but do not mention it yet. After moving a few times between the front and back positions have your client find neutral pelvis (in between the practiced positions) with the weight slightly forward on the sit bones (ischial tuberosities) and the feet weighted on the floor. In the neutral pelvis position, there is a equal activation of the transversus abdominis in the front of the waist and the lumbar multifidus in the low back to create an equal supported lift much like squeezing toothpaste from both sides on the bottom produces the lift out the top. This abdomen/low back gentle lifted squeezing can also be felt at the sides of the pelvis. This comfortable lifted synching feeling (much like pulling the string to tighten a duffel bag) is important to hold and maintain the neutral pelvis position once it is located and experienced. Repeat the exercise again and have your client notice the weight on each sit bone while rocking front to back. Have your client put more weight on the right side, then the left, followed by weight equal in the center. The hard rotator disc makes this easier for your client to feel shifts of weight. If you previously noticed your client shifting more weight to one sit bone in the exercise, ask him/her if one side or another is more comfortable and see if it correlates to your previous observation. If your client tends to sit toward one side, suggest that he/she check in throughout the day to see if this is a habit. Your client is best equipped to make this correction and develop the new habit through conscious attention and a commitment to change. Next ask your client to rock from side to side feeling each sit bone (the carriage will be stationary). Have your client push off of the right sit bone to sit up taller moving the head toward the ceiling as if making space for the kidney and notice the activation of the right lumbar multifidus muscles. Raising the arms overhead can sometimes make the firing of the low back muscles easier feel. Repeat it to the left. Both sit bones weighted with lateral rib shift. After about 5 sets, have your client now try to lift the ribcage laterally to the right while sitting up tall, keeping weight on BOTH sit bones. Have your client observe now that both sides of the lumbar multifidi are activated—it is like having two “rocket boosters” (one on each sit bone) to lift the ribcage off the pelvis instead of one. This equal activation creates a more powered balanced lift. It may be difficult for your client to keep both sit bones weighted in the lateral ribcage shift. Suggest that the bones of the pelvis are like a boat weighted in the water. Keep the boat heavy while the muscles and flesh lift upward into the lateral shift much like the vertical mast. You may see a crossover from the previous exercise. For example, if you client felt more comfortable with the weight on the right sit bone moving front to back, he/she may tend to lift the left sit bone as the ribcage moves sideways to the right since it is not used to bearing weight. Right lumbar and thoracic rotation. The client is sitting on a moving rotator disc so that lumbar rotation of the pelvis is proprioceptively accentuated. Driving the disc is somewhat like moving the wheel of a car: pulling down on the wheel to make a right hand turn would cause the left side of the wheel to move upward, much like moving the right sit bone backward to rotate the disc clockwise would move the left sit bone forward to further rotate the disc clockwise. Have your client rotate the disc to the right while keeping both knees still and holding the Reformer carriage in place. Most people will shift to one sit bone on rotation so instruct your client to drop the lifted sit bone (“sit the boat in the water”). Be sure to initially isolate pure lumbar rotation by keeping the chest facing forward in place. Repeat to the other side. Watch to be sure your client keeps weight on both feet as there is a tendency to roll one knee inward during the exercise. After your client experiences moving the disc in rotation, add the thought of siting tall during this twist and to engage the transversus abdominis (lower abs) and lumbar multifidus (low back muscles) so that there is a feeling of lifting upward through the spine. Just as it is necessary to bend the knees and go into the floor prior to jumping, the pelvis must first be weighted on the disc in opposition to the lifted ribcage. Both “rocket boosters” (ischial tuberosities) should be connected in a centered pelvis giving more power to the lift since both sides of the back will be active. Incorrect lateral rib shift with one sit bone weighted. Now move the pelvis, chest and head in succession during the rotation. It should feel like a spiral staircase moving upward. Notice if the ribcage moves laterally off the pelvis during rotation and indicate the necessary correction to bring the ribcage centered over the pelvis—if the ribcage is shifted, odds are that one sit bone will also be lifted. Just as in stacking blocks, the lumbar and thoracic sections of the spine are structurally solid on top of each other, rather than precariously stacking on the counterbalanced edges. Conscious and attentive self-awareness of pelvic placement in a seated position can improve overall posture. Just as a building needs a good foundation, the spine’s structural integrity is dependent upon a solid base. Your client can create new sitting habits, but must first have the knowledge and experience of how to find center. The best way to experience center is through its contrast of shifting weight off-center. Once the relative position of center is understood, and the weight over the ischial tuberosities felt, your client can consciously maintain balanced alignment through daily practice. Stretching leg muscles with a Thera-band® improves flexibility in the legs, but also relieves tension in the hips and low back with minimal time and effort. The Thera-band is a resistance exercise band available in a variety of strengths indicated by color (the thicker the band the stronger the resistance). Bands are often used in physical therapy rehabilitation, since patients can maintain a consistent practice working at home and strength development can be easily monitored with the progressive color coding system. They can be purchased individually or in bulk rolls and are sold under a variety of brand names offering latex and latex-free versions. (I prefer black Cando bands.) The 50-yard roll can be cut into individual bands making it economical to provide multiple clients and mat class attendees with equipment. Although there are multiple uses for Thera-bands in an exercises program, leg stretches yield quick results and are easy for most clients to practice. As with any stretching program, consistency with a long-term commitment to practice is essential. Using a pain scale of 1-10 with “10” being the most intense is a good guide to check in and keep clients on track. As a general gauge, “7” on this scale means your client will be actively stretching without strain or pain, but individuals vary and some may require less intensity. Microscopic tearing of the muscle fibers is a risk for overstretching and the scar tissue that develops can lead to a decrease in muscle elasticity so “more” is not always better. If your client has strained a muscle, stretching may cause further harm, so be sure no chronic condition exists prior to starting a new routine. Stretching after warming the muscles is preferable so a brief warmup such as a short walk can be useful to elasticize the collagen fibers prior to stretching. Stretches should be held for thirty seconds to a minute and should evolve; as the stretch is held, the intensity diminishes requiring the limb to move into a greater range to maintain the “7” on the pain scale. These stretches will always be a bit uncomfortable (they should not be painful). Regular practice will increase range of motion and the discomfort will be experienced similarly in the newer more flexible range. The stretch reflex is the body’s protective tool to prevent muscle fibers from overstretching and helps protect the tendon origins and insertions from being over-pulled. When the stretch intensifies, the muscle being stretched contracts to prevent it from being forced beyond normal range. Putting the muscle being stretched in contraction helps to inhibit this reflex and can make the process safer and more comfortable. For example, when stretching the hamstrings with the Thera-band, press the leg slightly toward the floor to engage the hamstrings while pulling the band with the hands bringing the leg closer to the chest. Conscientious breathing will allow the body to relax with the stretch. Breathe into the tension of the stretch on the inhalation and let it go on the exhalation. This push/pull quality (pushing the limb and pulling with the band) applies to all of the following stretches and will make them feel more like pushing through peanut butter or working with taffy rather than the slack feeling of hanging in a hammock. Although the following descriptions indicate which hand to use to hold the band, this is a personal choice based on comfort and body limitations. For example, if your client has arthritis a two-handed hold might be more comfortable or Thera-band exercise handles could be used to reduce grip tension. The objective is to stretch the gastrocnemius and the soleus muscles. Place the band with its full width across the metatarsals (don’t let it bunch up like a tourniquet) and hold each side of the band in either hand. Make sure you do not have a “death grip” on the band or your fingers will fatigue too quickly. Inhale—plantar flex the ankle moving the metatarsals (or ball of foot) into a demi pointe (half point) while spreading the toes. Exhale—dorsiflex the ankle and keep the toes spread. Repeat this approximately five times making sure to keep the hip of the stretching leg pressing into the floor, so the initiation of the movement starts at the core with the ankle being the end result. Variations of this stretch include ankle inversion, eversion and circles. Be careful on inversion to press from the fifth (pinky) metatarsal straight from the body without “sickleing” (shifting medially). A sickled foot is an instable ankle twist waiting to happen in the future, because it lacks strength. The objective of this exercise is to develop ankle strength and flexibility in the calf. This kind of ankle work is very useful for ballet dancers trying to achieve more articulation in their feet. The objective is to stretch the semimembranosus, semitendinosus and biceps femoris muscles. After working the ankle in the above exercise remain in the dorsiflexed position. Inhale—press the thigh toward the floor slightly to activate the hamstrings while keeping the band pulled toward the chest. Exhale—pull the leg closer to the chest while retaining some tension in the hamstrings as if still trying to lower the leg to the floor. Never “yank” on the leg. This stretch can be performed with a bent or straight knee. Both are useful and stretch either the belly of the muscle or the back of the knee. If the knee is bent, keep energy reaching through the heel toward the ceiling so the stretch remains active. This stretch is like a tug of war with the heel being one team and the ischial tuberosity (sitbone) being the other. Both sides need to actively pull on the rope. The objective is to stretch the adductor magnus, adductor longus, adductor brevis, gracilis and the pectineus muscles. It is sometimes more comfortable to hold the band in the same hand as the working leg—left hand holds the band when opening the left leg so the right shoulder can stay open and relaxed on the floor. Open the leg laterally while externally rotating the hip joint. The opposite side of the pelvis should remain on the floor and the body should not roll toward the open leg. If your client is unable to keep the opposite hip down, bend and externally rotate the knee of the leg on the floor to provide a little more leverage in the counterbalance. Be sure the chest presses into the floor and the abdominal muscles are actively engaged. If the abs are not engaged and the ribs lift off the floor, your client may push the head into the floor for leverage creating a discomfort in the neck and shoulders. Use the same push/pull tension strategy as explained in the previous stretches (inhale while creating tension and exhale as the stretch increases). As the leg moves wider and externally rotates, the foot moves closer to the ipsilateral ear, but the hip should remain anchored and the pelvis square. There is a tendency for people to hike the hip in an effort to achieve greater range of motion. A hiked hip does not stretch the inner thigh more—it is like the tug of war image used before except one team walks forward and the other walks backward as they pull apart. The hip must remain down to get the oppositional energy flow. The objective of this stretch is to stretch the gluteus medius, gluteus minimus and tensor fasciae latae muscle down into the illiotibial tract. Move the leg medially across the center of the body until the hip slightly lifts off the floor, but not so much that a full twist occurs in the lumbar region. It is not important for the leg to reach across the body very far, the stretch occurs when the hip pulls back into the floor (the foot in the band remains held in space and the hip pulls downward in opposition). Having the band in the opposite hand of the leg that is stretching contributes to this opposition. 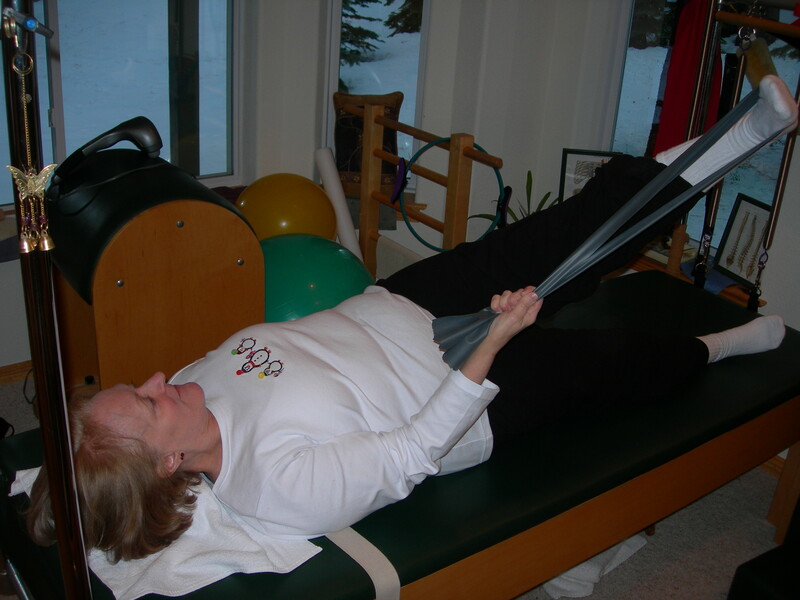 Inhale—pull on the band slightly and press the leg laterally into the band to create tension. Exhale—keep the foot held in space and drop the hip toward the floor using the internal obliques to rotate the spine. Be sure to also lengthen the waist by pulling the head and tailbone apart. The circumduction of the hip joint reviews all the previous stretches. The image of an ice cream cone can be a useful tool to mimic the conical pathway. The emphasis should be to press the hip into the floor where the ice cream would go at the tip, and then draw the lip of the cone either on the ceiling or on the walls if your client has greater range. Keep that feeling of pushing through taffy and guide your client to make sure that each hamstring/adductor/abductor position previously stretched is addressed. The leg must externally rotate each time the leg moves laterally to guide the ball in the socket of the hip joint comfortably. Correct the pathway or limit the range if your client experiences clicking in the hip joint. Be sure to circle both clockwise and counter-clockwise three to five times each. The objective is to energize and lengthen both legs while simultaneously activating the core. The feeling should be like doing splits on the ceiling. Hold the band in both hands with an underhanded grip to encourage the shoulders to stay down. Split the legs apart with the lower leg off the floor and lift the head off the floor as well (if your client has neck discomfort keep the head on the floor). Inhale—press the thigh into the band as in the previous hamstring stretch. Exhale—pull the top leg slightly toward the chest while preventing the hip from hiking and deepen the belly scoop. Draw in the transversus abdominis deeper on each exhalation. Hold for three to five breath cycles. There is a correlation between leg stretching and improved posture in the spine. Tight hamstrings will encourage a posterior pelvic tilt eliminating the necessary lumbar curve for lifted posture (see article The Use of Imagery to Help Your Client Find Lift Through the Core). The lumbar lift and core stability available in a neutral pelvic placement is diminished with the downward pressure of the tucked pelvis. If your client experiences low back pain, leg stretching with a band may be one component in a program to improve this condition. Regular leg stretching with Thera-bands can improve mobilization at the hip and ankle joints better preparing your clients for whatever activities they choose. Bands are portable and require almost no storage space and are great for traveling. The leg stretch series also increases blood flow, which facilitates the body’s ability to heal and repair itself. Have your client notice the energy flow into the stretched leg prior to switching sides. Your client should be able to perceive the asymmetry of the stretched and unstretched leg. Noticing an immediate difference for the effort exerted is a great motivation to keep stretching and will keep your client consistently practicing at home. Better posture, improved range of motion, healthy blood flow…what’s not to love! Rotator discs are a great tool to improve dancers’ pirouette form and are also useful for non-dancers to experience postural alignment along a center axis. Although proper alignment prevents injuries and allows our bodies to move most efficiently, it can be challenging to maintain this interlocking jigsaw-like relationship when put in motion. A spinning motion along a central axis using rotator discs can proprioceptively illustrate an understanding of alignment better than words ever could. Your client will either maintain balance and have a conscious experience of a “center” line through the body like that of the lead of a pencil, or she will lose balance and have a warping disjointed experience demonstrating that posture was not maintained. Rotator discs come in different sizes and are basically two circular plates with ball bearings in the center. You will want to choose a size that is large enough for your client to stand on with both feet side by side—12” is generally good choice. In preparation for this exercise, be sure your client has a clear understanding of proper alignment in a static position and how to engage her core muscles. (See article “The Use of Imagery to Help Your Client Find Lift Through the Core.”) Do not put any person into this exercise who has difficulty balancing on one leg, as the exercise would be too advanced. Make sure to spot your client in case she loses her balance, and allow plenty of floor space around the disc free from any obstacles. Start your client with one foot on the floor and the other foot placed on the disc. An outside or en dehors turn has the right foot on the disc and requires a counterclockwise turn with the left foot pushing off the floor and then stepping onto the disc. For an inside or en dedans turn to the right, the right foot starts on the disc with the left foot pushing off the floor and turns clockwise. Use the back foot to push off the floor providing momentum for the turn and step quickly onto the disc with both feet. Applying too much force will throw your client off-balance or increase the revolutions to possibly make your client dizzy. It is best to start with minimal force until your client gets used to how much pressure to apply against the floor. Have your client continue to turn until the disc slows and comes to a stop. Be sure to practice both sides and change directions every few turns. If your client is a dancer, have her practice “spotting” in the turn. The placement of the arms should be considered in the turn. You can have your client hold her arms by her sides or in front of her as if she is holding a ball. If you have a ball that is the size of a beach ball it can be useful to actually hold the ball at the chest. Note that your client might feel more secure having her arms free when first attempting this exercise in case she loses her balance. If your client is a dancer, the arm placement can be more complicated with the preparatory position in ballet 3rd position moving to 1st position in the turn. Dancers can sometimes lose the volume of 1st position when turning, so holding the ball can give your client a sense of width between the elbows. Make sure that your client anchors her scapulae as well so that the arms are connected to the back with strength. The ball should be placed in the “following” arm, not the lead arm. The arm that follows into the turn is more significant since it provides the “snapping in” effect providing momentum. If this arm is not lively and connected into the back the turn will lose energy and stability. Practicing this movement first with the ball patterns the arm to move toward the midline of the body with volume and proper timing. Rather than just standing on the rotator disc with both feet flat, dancers can progress to having the working leg in forced arch, coupé and then passé. As the level of difficulty increases, be careful to decrease the torque exerted against the floor or the turn will be difficult to maintain. Parallel and turned out positions are both suitable for practice, but parallel may be preferable for the general public or contemporary dancers. Rotator discs can effectively teach the concept of center. Your client must stabilize her core (the center of gravity) in addition to holding postural alignment (center axis). When using a rotator disc, the central axis of the body is like the pole in tetherball and the turning action represents the ball going around the pole. It is essential to have the body aligned or the turn will wobble like a tetherball would around a bent pole. Your client receives immediate feedback as to her success and can adjust accordingly. The experience of turning on the rotator disc becomes her instructor and teaches the concept of center better than your explanation ever could.